In 1871 the U.S. government charged George Wheeler with exploring and documenting the uncharted expanse of American land west of the 100th Meridian. The medium was just over three decades old at the time, but photography's proven effectiveness as a pictorial medium compelled Wheeler to include a photographer on his expeditions. In 1871, 1873 and 1874 the photographer was Timothy O'Sullivan – one of the medium's most talented practitioners – and in 1872 William Bell replaced him on the team. Despite the arduous topography and a complicated photographic technique, O'Sullivan and Bell produced some of the most breathtaking and memorable images in American art. Their photographs not only documented territory; they forged our vision of the landscape, its indigenous population, and the mining camps that dotted the western frontier. This exhibition will present approximately 65 albumen prints and stereographs made for the project by O'Sullivan and Bell, along with the maps that resulted from Wheeler's surveys. The exhibition is curated by Lisa Hostetler, Milwaukee Art Museum assistant curator of prints, drawings and photographs with materials drawn from the American Geographical Society Library at the University of Wisconsin-Milwaukee. 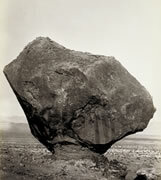 William Bell, Perched Rock, Rocker Creek, Arizona, 1872. Albumen silver print from glass negative. Collection of the AGS Library, University of Wisconsin-Milwaukee Libraries.